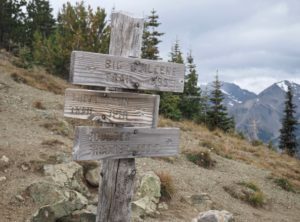 A worthy destination itself, Marmot Pass is also a crossroads for trails to Boulder Camp, Tubal Cain mine, and other points between and beyond. Upper Big Quilcene Trail, September 22, 2016. At Marmot Pass, several trails popular with both day hikers and backpackers meet in a sweeping alpine meadow with a tantalizing glimpse of additional Olympic peaks beyond. The Upper Big Quilcene Trail offers a pleasant route to the pass, first tracking the upstream reaches of the Big Quilcene River (which is but a creek at this point) through mossy, old-growth forest, then gradually climbing the valley wall and traversing the alternating upland woods and talus slopes below the pass. Along the way, the stone-strewn mountainsides offer intermittent views of the crag-lined river valley and a surprising array of spring and summer wildflowers. Although the trail includes no alternate routes or side paths before the junction at the top of the pass, estimates of its round-trip distance to the pass vary widely from as low as 9.80 miles/15.80 km to 12.50 miles/20.00 km. The 13.00-mile/21.00-km distance noted here is based on HesperosFlown.com’s personal experience. Regardless, the trail is a popular destination — expect to encounter a few other hikers, although at widely spaced intervals with plenty of solitude between. Mountain goats are commonly sighted along the trail. Enjoy them from afar and do not approach them, as encounters can be dangerous. Given the trail’s relative remoteness, no sounds of civilization intrude upon the wilderness tranquility. Along almost half the trail’s distance, its namesake river plays hide-and-seek amongst jumbles of moss-capped stones and seedling-topped timbers. Upper Big Quilcene Trail, June 16, 2016. At its lower elevations, the trail is walled by a tapestry of towering conifer columns laced with a verdant weft. Upper Big Quilcene Trail, June 16, 2016. 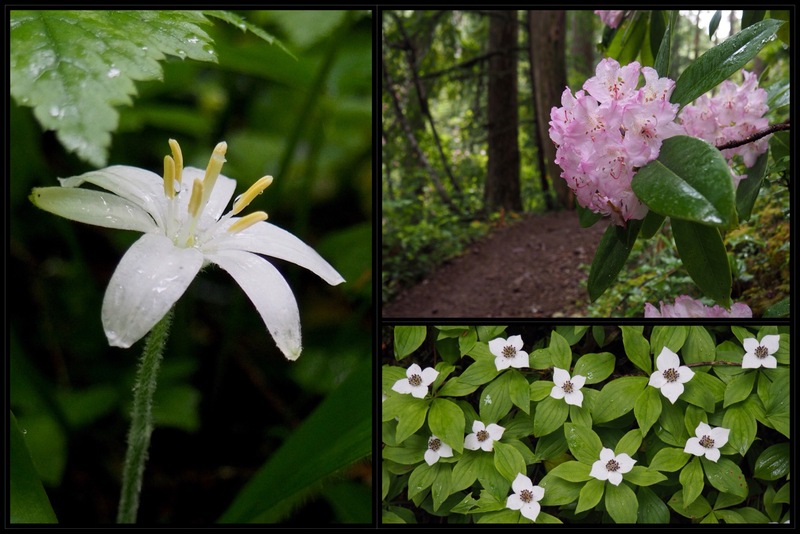 In late spring, Washington’s state flower, the Pacific, or coast rhododendron (Rhododendron macrophyllum) (upper right) graces the shadowy, lower-elevation woodland with giant blossoms rivaling those of its hybrid garden cousins in form and hue, while queen’s cups (Clintonia uniflora) (left) and western bunchberries (Cornus unalaschkensis) (lower right) carpet the forest floor with myriad starry blooms. Upper Big Quilcene Trail, June 16, 2016. In the moist, riverside woodland, coralroot orchids flourish. 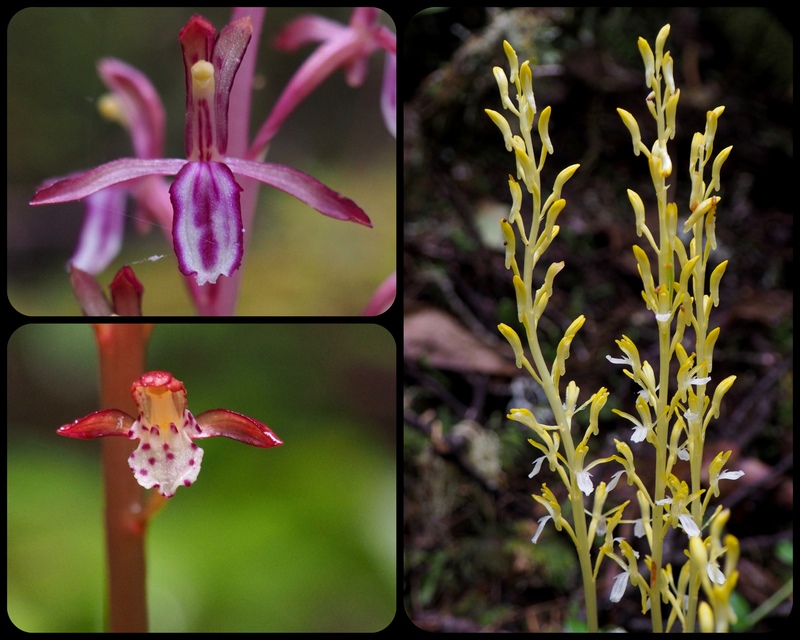 In the upper left photo, a western coralroot (Corallorhiza mertensiana) displays its standard, magenta-streaked form, although significant color variation exists in this form and location. The uncommon clear yellow and white form of the western coralroot (C. mertensiana f. albolabia), shown in the right photo, also brightens the trailside. The spotted coralroot (C. maculata), shown in the lower left photo, is abundant as the trail climbs higher along the river. Upper Big Quilcene Trail, June 16, 2016. 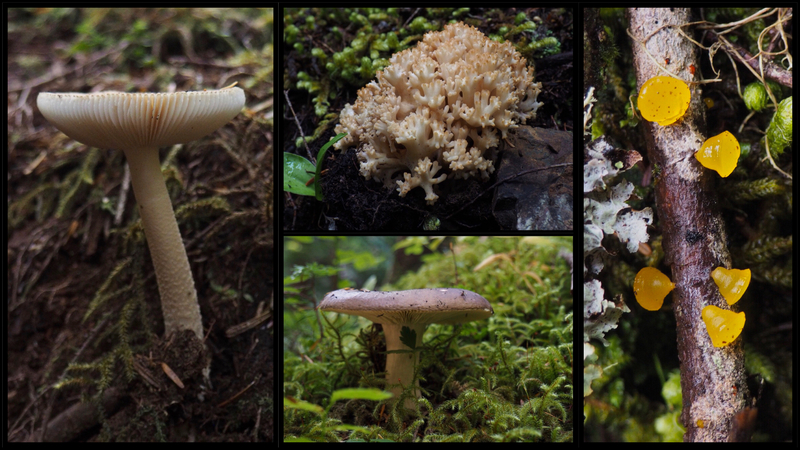 Throughout the trailside, keep watch for the various curiously formed mushrooms and other fungi, including coral fungi (upper center) and jelly fungi (here, the fancifully named poor man’s gumdrops, Guepiniopsis alpina, right) that thrive in the moist litter of the forest floor. Upper Big Quilcene Trail, June 16, 2016. Several brooks dash across the trail and, when swollen with spring snowmelt, may result in dampened boots. Upper Big Quilcene River, June 16, 2016. As the trail climbs higher along the steep-walled valley, it enters patches of drier forest seemingly bereft of life in comparison to the lush woodlands along the river below (upper left). Soon, however, the trail reaches the lichen-draped upland forests cloaked in wisps of common witch’s hair (Alectoria sarmentosa) interspersed with darker strands of tree hair (Bryoria sp.) (upper right). The lichens do not harm the trees, but take advantage of their airy perches for exposure to light, water, and nutrients. 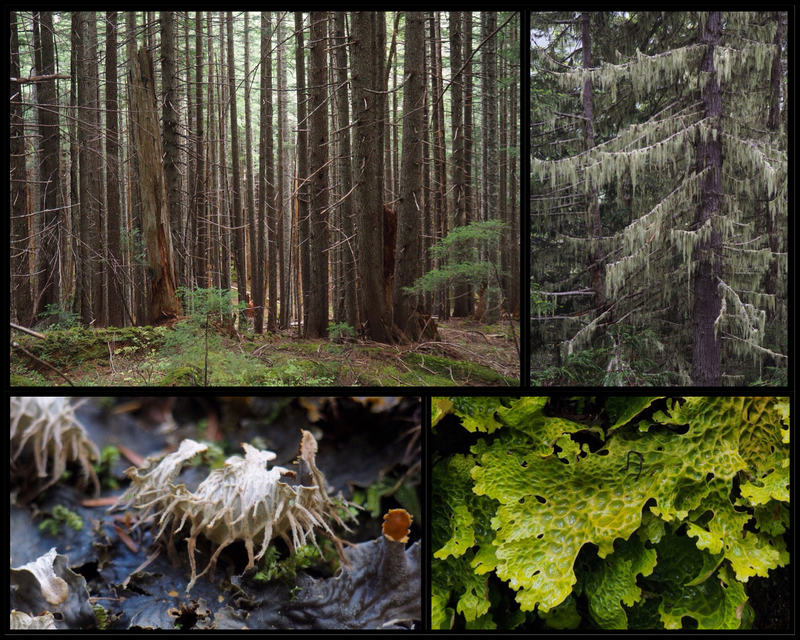 Sensitive to air pollution and habitat destruction, lichens are indicators of woodland health and abound on many surfaces throughout the trailside’s old-growth forest. Dog lichens (Peltigera sp.) creep across the forest floor with root-like rhizines along their upturned edges (lower left), while lungworts (Lobaria sp.) liven wayside stones with lettuce-like vegetation thought to resemble lung tissue (lower right). Upper Big Quicene Trail, June 16 and September 22, 2016. Between swathes of forest, great talus slopes sweep from the eaves of Buckhorn Mountain. Upper Big Quilcene Trail, June 22, 2016. Where the forest opens, views open across the narrow river valley to the line of minor peaks known as the Ridge of Gargoyles that terminates in the higher and separately named Boulder Ridge near Marmot Pass. Visible here are, from left to right, The Turret, Upper Gargoyle, and Boulder Ridge. Upper Big Quilcene Trail, September 22, 2016. Even when the clouds that frequent the Olympics descend, look up for glimpses of the Gargoyles along the trail. Upper Big Quilcene Trail, June 16, 2016. As the trail climbs, forest clearings and rocky mountainside meadows host brighter blooms, including various paintbrushes (Castilleja sp.) (first column), Scouler’s valerians (Valeriana scouleri) (second column, top), larkspurs (Delphinium sp.) 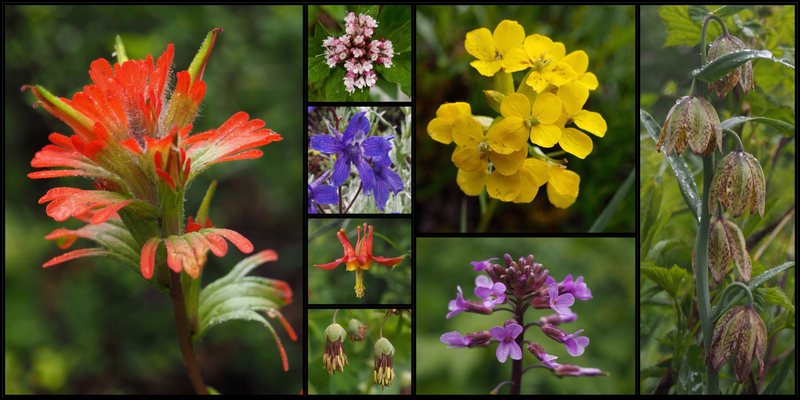 (second column, upper center), Sitka, or, western columbines (Aquilegia formosa) (second column, lower center), western meadow-rue (Thalictrum occidentale) (second column, bottom), sand dune wallflowers (Erysimum capitatum) in both their common yellow and uncommon purple forms (third column), and chocolate, or, checker lilies (Fritillaria affinis) (fourth column). Upper Big Quilcene Trail, June 16, 2016. In its final ascent to Marmot Pass, the trail climbs through subalpine forest and meadows, seen here in a glance back down the trail. Upper Big Quilcene Trail, September 22, 2016. In the harsher climate near the treeline, still other blooms flourish, including lupines (Lupinus sp.) 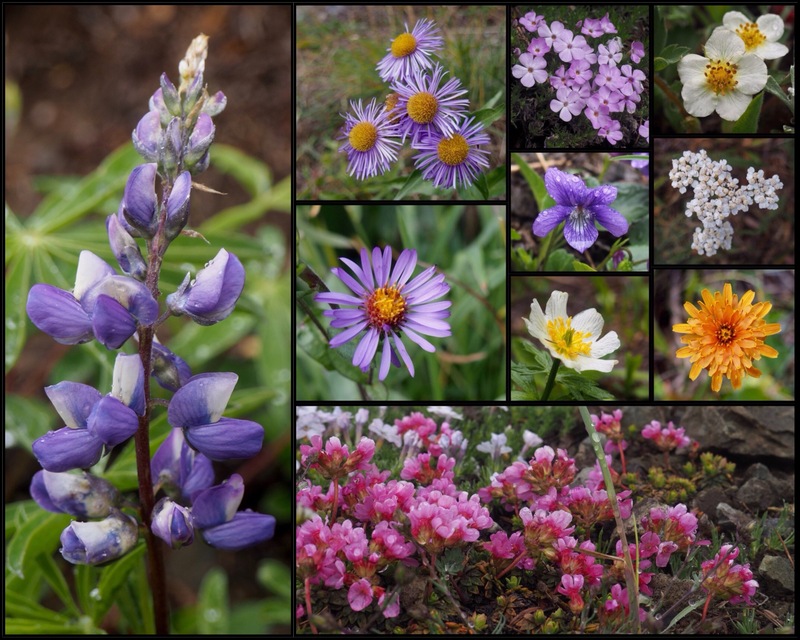 (first column), splendid fleabanes (Erigeron speciosus) (second column, top), alpine leafybract asters (Symphyotrichum foliaceum) (second column, center), spreading phlox (Phlox diffusa) (third column, top), violets (Viola sp.) (third column, upper center), western globeflowers (Trollius albiflorus) (third column, lower center), strawberries (Fragaria sp.) (fourth column, top), common yarrow (Achillea millefollium) (fourth column, upper center), orange agoserises (Agoseris aurantiaca) (fourth column, lower center), and cliff dwarf-primroses (Douglasia laevigata) (bottom). Upper Big Quilcene Trail, June 16 and September 22, 2016. Beyond the final climb, Marmot Pass’s vast alpine meadow is attained. Trails ring the meadow and lead to a junction with several others at the top of the pass. Upper Big Quilcene Trail, September 22, 2016. 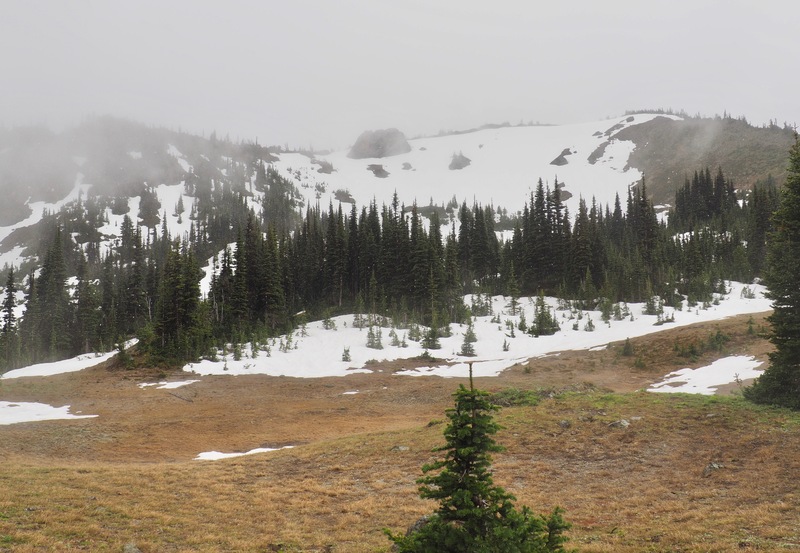 Snow often persists — and falls — late in the season at Marmot Pass. Upper Big Quilcene Trail, June 16, 2016. From the top of Marmot Pass, views stretch in both directions; here, eastward back down the meadow and across the now distant Ridge of Gargoyles. Upper Big Quilcene Trail, September 22, 2016. Buckhorn Mountain looms to the northeast of Marmot Pass. From the Tubal Cain Trail a short distance from the junction on the pass, a steep, one-mile/1.60-km side trail leads to its summit. Upper Big Quilcene Trail, September 22, 2016. West from Marmot Pass, the view reaches across the Dungeness River Valley to the expanse of Olympic peaks beyond. Upper Big Quilcene Trail, September 22, 2016.